Intensified efforts to conduct broad immunization campaigns have prevented almost 14 million deaths from measles worldwide since 2000, according to a new global report prepared jointly by U.S. and World Health Organization (WHO) experts. About 145 million children received measles vaccines from 2000 to 2012, resulting in a 77 percent decrease worldwide in the incidence of the highly contagious viral disease. Reported cases declined from 146 cases per million people to 33 per million. Saved lives and less disease are certainly achievements, but these improvements are not great enough to achieve complete measles eradication by 2015. The World Health Assembly, with membership of 194 nations, declared a goal in 2010 to deliver routine measles vaccination to more than 90 percent of 1-year-old children. 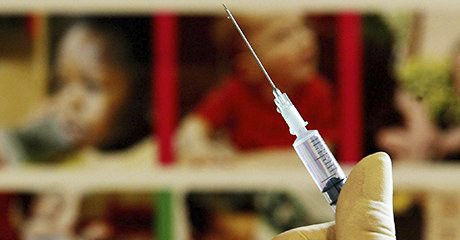 The analysis prepared by the World Health Organization’s Strategic Advisory Group of Experts (SAGE) finds that routine immunization is reaching about 84 percent of these youngsters and has remained stuck at that level for four years. Achieving eradication by 2015 would also call for measles incidence to remain at fewer than five cases per million. The incidence level recorded in 2012 fell well short of that goal. Creating yet greater distance to the goal, 2012 might have been a temporary low in the cycle of measles incidence, the experts say, with another spike to occur in the near future. To remain on pace to defeat measles, national public health agencies must reach more than 95 percent of children with initial vaccines and booster vaccines. Further, they must have the capability to conduct supplemental vaccination campaigns to catch youngsters missed in the first round. And they need to maintain that level of vaccination coverage year after year. The scale-up in immunization activity in recent years has been conducted under the Global Vaccine Action Plan, a collaborative effort of WHO, UNICEF, the Bill & Melinda Gates Foundation, the GAVI Alliance, the U.S. National Institute of Allergy and Infectious Diseases and the African Leaders Malaria Alliance. Is The Measles Exposure Possible?